Data leakage is the unauthorized transmission of data from within an organization to an external destination or recipient. The term can be used to describe data that is transferred electronically or physically. Data leakage threats usually occur via the web and email, but can also occur via mobile data storage devices such as optical media, USB keys, and laptops. Barely a day goes by without a confidential data breach hitting the headlines. Data leakage, also known as low and slow data theft, is a huge problem for data security, and the damage caused to any organization, regardless of size or industry, can be serious. From declining revenue to a tarnished reputation or massive financial penalties to crippling lawsuits, this is a threat that any organization will want to protect themselves from. There are many different types of data leakage and it is important to understand that the problem can be initiated via an external or internal source. Protective measures need to address all areas to ensure that the most common data leakage threats are prevented. "Unauthorized" data leakage does not necessarily mean intended or malicious. The good news is that the majority of data leakage incidents are accidental. For example, an employee may unintentionally choose the wrong recipient when sending an email containing confidential data. Unfortunately, unintentional data leakage can still result in the same penalties and reputational damage as they do not mitigate legal responsibilities. Many organizations give employees access to the internet, email, and instant messaging as part of their role. The problem is that all of these mediums are capable of file transfer or accessing external sources over the internet. Malware is often used to target these mediums and with a high success rate. For example, a cybercriminal could quite easily spoof a legitimate business email account and request sensitive information to be sent to them. The user would unwittingly send the information, which could contain financial data or sensitive pricing information. Phishing attacks are another cyber attack method with a high data leakage success rate. Simply by clicking on a link and visiting a web page that contains malicious code could allow an attacker to access a computer or network to retrieve the information they need. The threat is real, and real threats need serious data leakage prevention. Data loss prevention (DLP) is a strategy that ensures end users do not send confidential or sensitive information outside of the enterprise network. These strategies may involve a combination of user and security policies and security tools. DLP software solutions allow administrators to set business rules that classify confidential and sensitive information so that it cannot be disclosed maliciously or accidentally by unauthorized end users. 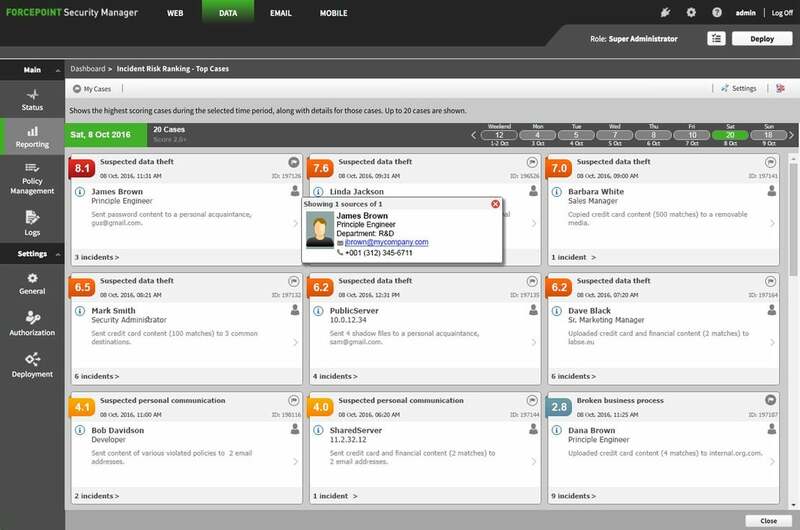 Forcepoint's DLP solution allows you to discover and control all sensitive data easily and identify your riskiest users within seconds. Whether you need to apply controls to source code, engineering drawings, financial data or sensitive trade secrets, our solution gives you granular control over the data that matters without affecting productivity and progress.